Why is it so important for us to pay attention to how we preserve printed and digital photo content? What are some good first steps towards curating a printed or digital photo collection? How can we make the task of organizing less overwhelming? These are just some of the questions we answer in this episode of Structure and Flow, with our special guest Bonnie Shay. The answer is simple: you need to have the same organizational systems in place for your business assets (images, other digital assets) to be more productive. If you’re spending hours searching for that one image you downloaded once, that’s very inefficient! Bonnie Hillman Shay is a Certified Photo Organizer and founder of Mariposa Photo Organizing based in Highland Park, IL. 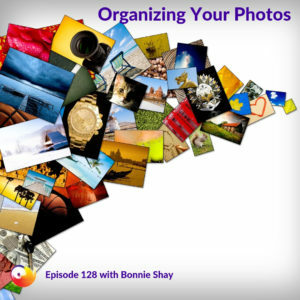 Bonnie helps her clients organize, edit, and back-up their printed and digital photo and video collections as well as create photo books, online photo galleries and other ways of sharing their photos. She wants her clients to have access to their family photo treasures so that they can enjoy them, manage them and share them with generations to come. Bonnie has been featured in numerous publications and presents for live audiences, on teleseminars, and webinars. Bonnie is a member of NAPO (The National Association of Professional Organizers) and APPO (The Association of Personal Photo Organizers).